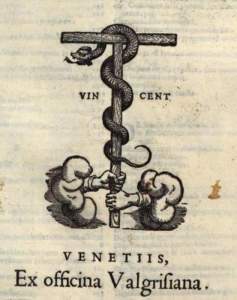 The printer's mark of Valgrisi. Two hands emerging from clouds to grasp the bronze serpent. 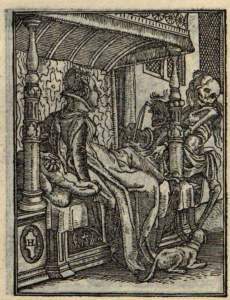 Valgrisi retained Hans Lützelburger's woodcutter's mark, HL, on the duchess' bedpost. riginally, Vincenzo Valgrisi was from Lyon and was named Vincent Vaugris, but he moved to Venice in the late 1530'ies. 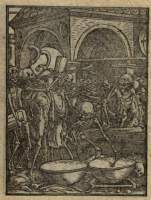 Valgrisi was the first in Italy to imitate Holbein's dance of death. 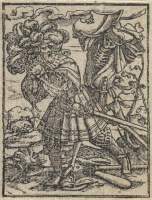 In 1545 he published "Simolachri, historie e figure de la morte […]", and in the preface he confidently claimed that his copies were far better than the originals. This was rather an exaggeration, but the woodcuts are in fact very detailed. 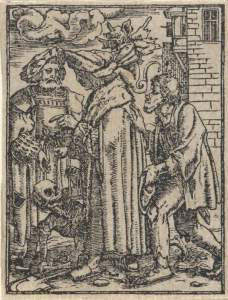 The book contains copies of all the woodcuts of the genuine editions of Holbein from the same year, with the exception of the beggar, who wasn't a part of the proper dance then. 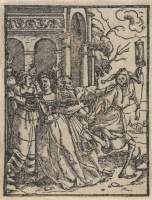 It wasn't until four years later, in 1549, that Frellon produced an Italian translation to accompany the genuine woodcuts by Holbein: "Simolachri historie, e figure de la morte. 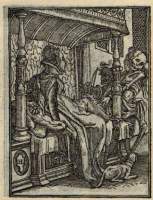 La medicina de L'anima. […]". In the preface Frellon warns against the "pirate copies" by Valgrisi and argues that the French woodcuts are far more handsome. Either as revenge or to save money, Frellon copied the text from the Valgrisi instead of paying for his own translation of the articles. These were troubled times with strife between Catholics and Protestants. 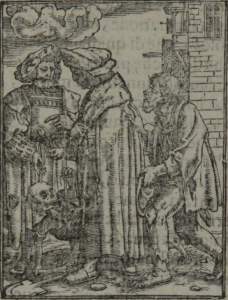 Valgrisi was the first, in 1548, to publish Giovanni della Casa's index of prohibited books: "Catalogo di diverse opere, compositioni, et libre". This was quite ironic since "Imagines Mortis" was on the list of prohibited books. 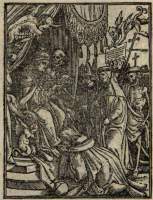 All went fine, however, until one day in 1570 when the Inquisition paid a visit. They found 1,100 forbidden books, including 400 copies of the Protestant version of "Simolachri, historie e figure de la morte", which had been disguised as letters of Cicero. Fortunately Valgrisi was at that time known as a good Catholic, so he got off with a fine of 50 ducats. Later on, Valgrisi's woodcuts were taken over by other publishers and used for illustrating Fabio Glissenti. Maybe they too feared the Inquisition, for as one can see on the pictures to the left and right, the detail with the little devil has been excised from the picture of the senator. Glissenti did the same thing to the pope. As the picture to the right shows, it has been a relatively trivial task to remove the flying devil along with its letter of indulgence. In contrast it has taken a greater effort to remove the devil that was crawling in the baldachin over the pope's head. A circle is clearly visible and shows how it has been necessary to drill out the offending area from the wood block, hammer a new plug in, and then cut new folds for the baldachin. 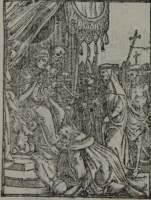 Valgrisi's woodcuts were later taken over by Glissenti.